Everything’s bigger in Texas. That’s what people keep telling us as the Episcopal Church gathers for its triennial General Convention in Austin. Since the Supreme Executive Committee believes nothing is bigger than Lent Madness, we fit right in here! We have a Texas-sized play-in match taking place TODAY as James the Great battles James the Less in a winner-take-all throw-down to become the first saint to crack the 2019 Lent Madness bracket. You can vote in one of two ways: online here OR by casting a special purple ballot at the Forward Movement booth in the Exhibit Hall. Polls will be open from 8:00 am to 5:00 pm Eastern time today only. It’s a short window, so cast your vote and tell all your friends to get to the polls! (as always, we encourage voting early but not often). If you’re in Austin, stop by the Forward Movement booth to meet Tim and Scott, take a selfie with an actual golden halo, and register your complaints about past and future brackets (which the SEC will “take under advisement”). For eagle-eyed attendees, you’ll also have the opportunity to spy Distinguished Celebrity Bloggers/General Convention Deputies Laurie Brock, Megan Castellan, and David Sibley. We’re grateful to veteran Celebrity Blogger David Creech for writing bios for both James the Great and James the Less (everyone else was either on vacation, working at the Convention, or ignored our email). You can take your cattle ranches and giant slabs of barbecue. Nothing’s bigger than Lent Madness in July! James the Great is the portrait of an imperfect saint. He is called “the Great” to distinguish him from “the Less.” The moniker denotes his prominence in the early tradition, not his superiority over the many other Jameses (if we’re honest here, James the Just has to take the cake). James is the older brother of John. They were fishermen with their father Zebedee until Jesus called them to follow him (see Mark 1:19-20). Bucking convention, where the student seeks the master, James and John dropped everything to follow Jesus. James is given a special place in the Gospels as an early follower of Jesus and as one who is given special access. He, along with Peter and John, is one of the few witnesses to the raising of Jairus’ daughter (Mark 5:35-43), the Transfiguration (Mark 9:2-9), and Jesus’ agony in the Garden of Gethsemane (Mark 14:32-42). In spite of this privileged place, James often exhibits weakness and lack of insight. He gives all of us hope. He and his brother are called “Sons of Thunder,” presumably because of their impetuousness. (Later hagiographers would say they were given the name for their thunderous, and effective, preaching.) In the Gospel of Luke, when a Samaritan village does not welcome Jesus, James and John ask if they should call fire from heaven to consume the village (Luke 9:51-56). James, with Peter and John, doesn’t understand the Transfiguration. He falls asleep while Jesus agonizes in the Garden. When Jesus tells his followers he must be rejected, condemned to death, mocked, and crucified, James and John reply by asking if they can be seated at his right and left hand in power (see Mark 10:32-40). According to Mark, James flees the crucifixion scene. In the Gospel tradition, James’ name always precedes John’s. Curiously, once Luke begins to tell his tale in Acts, James disappears while Peter and John act as the most prominent leaders of the nascent movement. This is perhaps because James, as the first martyr for the Jesus movement, was killed by Herod in the early 40s (see Acts 12:2). In a story recounted by Clement of Alexandria, James’ defense before Herod was so effective that the guard who was charged with watching him was converted and the two were killed together. O gracious God, we remember your servant and apostle James, first among the Twelve to suffer martyrdom for the Name of Jesus Christ; and we pray that you will pour out upon your Church that spirit of self-denying service by which alone we may have faithful witness among your people; through Jesus Christ our Lord, who lives and reigns with you and the Holy Spirit, one God, now and for ever. Amen. Little is remembered about James the son of Alphaeus. Part of the difficulty is the commonness of the name James in the New Testament. We have no less than four Jameses and often little more than their name. This confusion about the various Jameses has led to a conflation of these lesser Jameses into a single James the Less. Some affiliate him with Jesus’ brother and the leader of the Jerusalem community, James the Just, but this connection is difficult to maintain. His appellation, “the Less,” is derived from Mark 15:40, where the mother of James, the younger, is described as one of the women witnessing Jesus’ crucifixion. Again the connection here is tendentious. To add insult to injury, his name is not even James. Through a strange twist of fate and the peculiarities of medieval pronunciation of Latin (and perhaps with a little help from the translation of the Bible commissioned by King James), his original name, Jacob, has been translated consistently in English as James for over four centuries. In spite of this obscurity, James the Less was a member of Jesus’ closest circle. Although the lists of Jesus’ closest disciples vary from Gospel to Gospel, James is included in all the lists of the 12 and he is always listed first in the last group of four (see Matt 10:1-4, Mark 3:16-19, Luke, 6:13-16, and Acts 1:12-14). 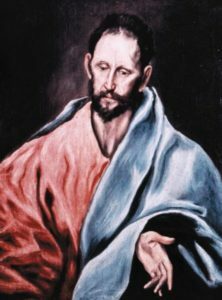 This prominence over the last group of four has led some to speculate that James the Less was particularly influential in the Jewish mission of the early Jesus followers. If this suggestion is followed, James the Less occupies an important position alongside Peter and Philip in the earliest movement. Peter heads the first list of four as prominent in the Jesus movement generally. Philip heads the second list of four as a leader in the Hellenistic community of believers. Later tradition has that James traveled to Egypt and was eventually martyred there. Images: Wikimedia Commons. James the Great, Guido Reni (1575-1642). 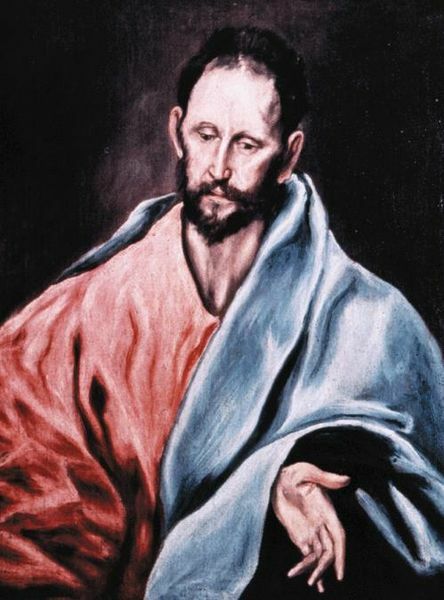 James the Less, El Greco (1541-1614). 56 Comments to "LM @ GC Play-In: James the Great vs. James the Less"
Woohoo, an early opportunity to be part of the anticipated Lentmadness action. Does Oliver know? Had to go with the Great James, seeing as how you all, and our prayers, are in Texas. Fare well til March! Oh, you Episcopalians! Always making me think and follow in the footsteps of Katerina Von Bora and Martin Luther! After much thinking, I must go with Great. Here is a man who knows what is right (following Jesus), tries to do what is right (comforting at The Garden and many others), repeatedly falls down (or falls asleep), yet still preaches life everlasting and is willing to die for his beliefs. He is the proto-Christain on whom we all are unwittingly modeled. And I’m jealous of our leaders in Austin, a wonderful town! It’s lovely to hear from the Lent Madness community in the summer – the community of people sharing their comments, and their faith, is truly the heart, and true joy, of Lent Madness – Happy Summer! I had to vote Less. As one who was always called by the wrong name, Sharon instead of Shannon, I could empathize with poor Jacob/James. Because of my devotion to his brother John, the other “dunderhead” (from the German donner, thunder), I have to go with James the Great. He may not be “beloved,” but he’s pretty good. P.S. I think you might mean “first Apostle and martyr,” as I’m pretty sure Stephen got there first (Acts 7:54). Thank goodness for a small dose of LM IN JULY! (Not that I’d ever wish for more Lent than we already have on the church calendar.) ~ Almost went for the Less but was compelled by the story of The Great converting his guard. James the Great. He , like so many of the disciples, reminds us of our frailty and strength. And how errant and selfish our ways can be sometimes in spite of our devotion and love of the Lord. I am so excited to vote in July!!! Yahoo and yippee as we say in Texas!! Wish i could be in Austin this week, but alas i am stuck up in the Panhandle. I can’t wait to see what Oliver writes also…thanks for this fun in the sun that has brightened my day! I was born in Dalhart. There are worst places be stuck than the Texas Panhandle. For instance, Austin in August. Hahaha! Great comment. I just received this email to vote this morning and would have voted for JtL also but wasn’t sure why exactly. Your comment expresses it precisely! The Less, for all the faithful whom we don’t know much about—but that they followed faithfully. Let’s not forget that pilgrims everywhere know James the Great as the namesake of the equally great (and challenging) Spanish pilgrimage route known as the Camino de Santiago de Compostela. I had to go with James the great, because I want sure which of the lesser James’ was worth of a vote. So there, S.E.C., take it or leave it! Tough decision since there was no mention for either of direct lineage to UT Football. However, the artist rendering of James The Great has component overtones of Longhorn strategy. The Great it is. PS – Seriously, thanks for the Hill Country (Boerne) rain this morning. I have to vote for James the Great, partly for his mother, who might be the parent he and John inherited their forthright nature from, and partly because of his faithful and powerful witness even when facing death. In a suitably penitent and Lenten spirit, I have to confess that I am never quite sure about amalgamated characters. This vote honors my cousin Pam and her pilgrimage along the camino. You guys make me happy to be Episcopalian…carry on, you are doing the Lord’s work!! James the Less, of course. Anyone stuck with a moniker like that deserves the support and compassion of all of us. Plus, the fact that he isn’t fighting the name is an indication that he is an example of true humility we all would do well to follow. he-e knows how to be humble. Was he one man, or one of four? for those he told of Jesus. Tough call. I usually back the underdog, so was leaning toward the Less, but the Great human frailty pulled me to the other side. Perhaps Great is really more. Most of you will not have heard that faithful LM follower and frequent commenter Harlie Youngblood died recently. Please pray for him and for his wife the Rev. Susan Youngblood. Thank you for sharing this sad news. We build community one comment at a time here at Lent Madness and Harlie was an integral part of this. May Harlie’s soul, and the souls of all the faithful departed, rest in peace and rise in glory. What Emily Shepherd said. It’s James the ostensibly Less for me. Compelled to vote for James the Great because of the movie, The Way. I, too, loved that movie! My boys are named Janes and John, of course I need to vote for James The Greater. LOVE IT. That is so great. Are they called Sons of Thunder? I am voting for James the Great, since he is the James of the Camino. As usual both very deserving. I have to say that you had me at fisherman. And in a shout out to Bishop Curry thunderous and effective preaching. Anyone who can fish and preach has my vote every time! Wish I could be there to get my selfie with you all. Another tough decision, but James the Great has the pedigree to win the Golden Halo. James is a great name, but I think Jim is a better name for the “lesser”. I admire his work as a leader in the very early Church in Jerusalem so Jim gets my vote. I voted for the Scallop Shell! Had to vote for the Patron Saint of our church…especially since his Feast Day is coming up soon. AND, he is such an enigma. 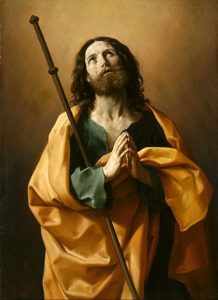 Still sorting through all the myths regarding St. James the Great and whether or not he REALLY did spend time in Spain. I like his zeal, oh Son of Thunder. El Camino de Compostela did it for me. A truly holy experience. Here’s to James the Great, who supposedly washed ashore in a coffin, I’ve heard. Much easier than walking the Camino. Voted for James the Great. Too much confusion on who James the Less actually is. So glad to be voting for LM in July. Stopped into the Forward Movement Booth at General Convention. Had a great time meeting Scott and Tim. Just love Lent Madness and the fun way we get to know the Saints through this program. Go Lent Madness”” How many more days until Lent?????? I thank GOD FOR ALL PEOPLE WHO LISTEN TO THE HOLY SPIRIT SAY HI TO BISHOP CURRY & ALL FROM THE STATE OF WASHINGTON LOVE IS THE ONLY TO GO ! Going with the Lesser James, both to make up for his troubles with keeping his own name and on the chance that he is indeed the brother of Jesus. Can you imagine how difficult it is to be the younger brother of someone who not only your mother thinks is the Son of God, but who actually is. Had to have been really annoying. I’m in just under the wire from Southeastern Indiana. 4:52 pm. James the Great’s my vote. I was tempted to vote for “the Less”simply because he is the underdog, but upon reflection it seems right to vote for him because he has been given short shrift. He was important to Jesus in spite of the confusion as to exactly which James he was; he was subjected to a change of name by the translators (as many were by customs officials!) So I think that he deserves his five minutes of fame (or infamy) in LM. How could I vote for James the Lesser when he seems to be a combination of four men named James, and his name was really Jacob! So, for all his flaws, James the Greater got my vote. All of them were named “Ya’akov.” Both “Jacob” and “James” are anglicized versions of the Hebrew “Ya’akov.” There is no “j” sound in Hebrew. But, of Course. Fisherman, early martyr, supportive of his brother, aka “Boanerges” in the tradition. At St. Philip’s in the Hills, Tucson, there are stained glass windows depicting each of the apostles. James the Lesser is titled “James the Miner” and is shown with a pickaxe! A little problem in translation, since the windows, if I remember right, were done by Mexican artists! I voted for James the Great, because of a long ago Spanish connection and he was a fisherman. Thanks to all for Lent Madness in July! Also, thanks and blessings to those at General Convention in Austin! Having hiked to Compostela last September, I have to vote for James the Greater, whose name, I am told, comes from the fact that he was taller than James the Lesser. I was with James the less until you got to Egypt. Saw a film where James was very mean to non Christians in Egypt. Everything IS bigger in Texas. We moved there when our youngest was in 11th grade, were there for 2 years; she ended up with a 6’8″ Texan husband she met in high school.